An ideal chef’s knife, aka all-purpose kitchen knife should be one that feels comfortable in your hand, and can slice through vegetables, nuts, and meats with ease. No two people have the same hands, nor do they have the same taste in food, so the knife that you will choose for your daily needs might differ from what the person next to you chooses. It all depends on the size of your hands, the type of food you plan to cut with your new found kitchen mate, and the cutting style you prefer. Some people choose to use heavier, Chinese cleaver-style knifes to cut meats while others use all-purpose kitchen knives for the same. Which is the best all-purpose kitchen knife for you? We have reviewed 4 of the top kitchen knives on the market, take a look and select the one that suits your style. 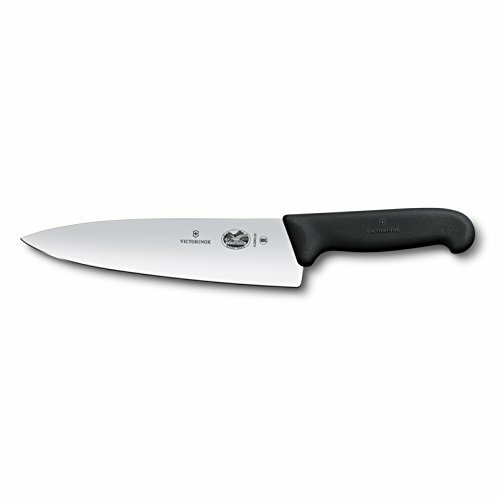 Sharp, balanced, and well-built, with a nice sloping curve and a forged high carbon stainless steel blade, this is the current bestseller in the market when it comes to all-purpose kitchen knives. Just so you know, this is made by Victorinox, the same Swiss company who is famous for manufacturing the original and authentic Swiss army knives. They are renowned for their impeccable standards of precision and fine craftsmanship that lesser companies can only hope to achieve. Every single blade is tested with lasers to ensure a perfect cutting edge, while the blade bodies are conically ground lengthwise and crosswise to result in an ultra-smooth polished finish that delivers next to no resistance while slicing or cutting. A textured, crack-resistant Fibrox handle guarantees a good grip and prevents the knife from straining or damaging your hands. Each blade has the company emblem and Swiss item number printed on it to ensure its authenticity. And you also get a lifetime warranty on this knife, which tells a lot about the QA offered by Victorinox. Whether it is chopping, slicing, dicing, or mincing, this all purpose and highly affordable kitchen knife will help you do it with ease. The handle on this knife is both comfortable, as well as a thing of beauty. It is tough, slip-resistant, and features a nice metal streak finish to complement the looks of the rest of your modern kitchen interiors. The hilt runs all the way through to the tip and you can see that the collar on this knife is thick and well-built to stop any wiggling or flexing while you cut through hard substances. The blade is 8″ long and made from high quality stainless steel which is easy to sharpen and rust-free. 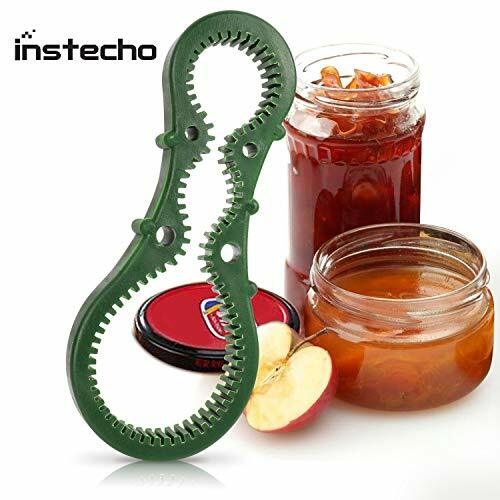 Its heel is blunt and square to let you cut through tendons and bone without risking injuries or damaging your blade, and the height of the blade ensures enough clearance for your fingers so that they do not bang into the cutting board as you chop. 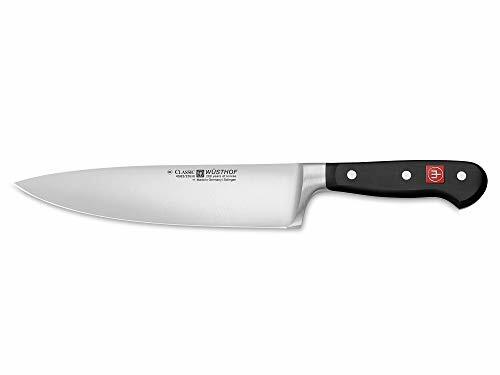 Featuring a full tang and a forged high carbon stainless steel blade, this classic cook’s knife represents the quality and precision of German engineering. It has a heavy blade that is supported by a thick collar, and the synthetic black handle blends in seamlessly with the tang leaving no room for food to get stuck in the knife. The handle is ergonomic for a smooth and firm grip, and you have a nice tapered slope in the collar that acts as a holding point for a choke on your knife. The hilt is strong and thick, and the height of the handle leaves enough clearance for even the thickest of fingers so that you don’t bang them on the board while cutting or chopping. The blade is 8″ long and has a highly polished, friction-free finish along with a gently curved cutting edge that is razor sharp. It combines the hardness and sharp cut of a high carbon blade with the corrosion proof nature and durability of a stainless steel blade, resulting in a long lasting and extremely effective cutting piece that stays sharp longer, even if you routinely chop harder substances such as nuts and meats. Hot drop forged from a single piece of high carbon German stainless steel, everything from the tip of the knife to the bottom of the handle is designed to deliver the most seamless and razor sharp cutting experience possible. The collar is designed with enough taper to allow for a nice choke and the height of the ergonomic handle leaves enough space for your fingers to comfortably curl around the handle and not risk hitting the board as you chop. Although it is dish washer safe, hand washing is still recommended to protect the rest of your utensils in the dish washer. 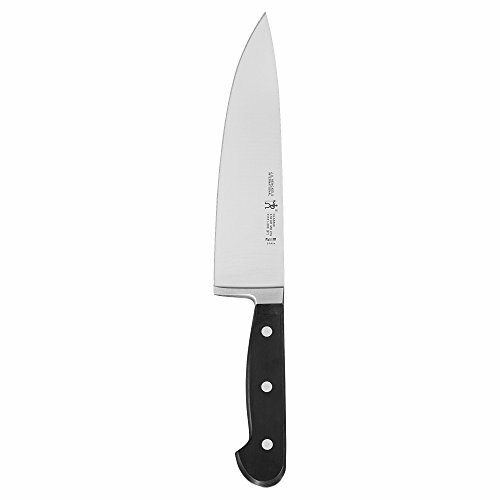 The broad and sharp 8″ blade is designed and manufactured in Germany, and is perfect for everything from chopping and slicing, to carving and dicing. A full tang triple rivet handle made from composite materials guarantees long life, and a comfortable grip. And, it also carries a limited lifetime warranty. Typically, a good all-purpose knife must have a blade length of 8″ to 10″, and must have a hilt that runs all the way down to the end of the handle. Make sure the handle is tough and made from relatively thick plates of plastic, fiber, or wood. Soft wooden handles or thin plastic handles will easily break under pressure, while antique bone handles crack with age. Get a hard wooden handle, and if you plan on cleaning your knife in a dishwasher (something that is normally not recommended), get a good fiber or plastic handle. The collar/ bolster of the knife, i.e. the point where the handle meets the blade, should be thick and provide enough support to the knife so it does not bend or wiggle while cutting through nuts and bone. A good all-purpose knife is supposed to have a broad and hefty heel for tasks that require you to yank the knife backwards and exert extra force. A good heel makes a nice, satisfying “thunk” when it hits the board. Moving on to the blade, this is probably the most important part of a good kitchen knife and you must be able to slice through stuff with minimal force if your blade is sharp. The best blades are made from high carbon stainless steel and are forged instead of stamped. Forged blades are made by hammering red hot steel billets into a shaped die. They are tougher, heavier, and more balanced than stamped knifes that are made by stamping a thin plate of sheet steel into a mold. We hope you have enjoyed reading our review to find the best all-purpose kitchen knife.